How Many Hours Do the Average Tanning Bulbs Last? New tanning bed bulbs are fully effective for the first 50 hours. These bulbs are so effective that tanning bed bulb sellers will warn most people not to tan with these bulbs if you are new to tanning. After 50 hours, the effectiveness of the bulbs are lowered by about 20 percent. Lightning bulbs after the 50-hour mark are often considered excellent for new and repeated users. The 80 percent effectiveness mark gives it just enough effectiveness without being too harsh on new skin. You can use your tanning bed bulbs until about the 500- to 800-hour mark, depending on the manufacturer and type of bulb. At the 500-hour mark, your bulbs may be only running at about 50 percent effectiveness. After about 1000 hours, your bulbs may not be working well at all. You can keep track of your tanning bed times with your own timer and many tanning beds now come with timers built in. You should keep a chart. If you are a personal owner of a tanning bed, ask the manufacturer for a copy of a timer chart or if they sell a bulb timer. If you are losing effectiveness before the 500-hour mark, your bulbs may need cleaning. 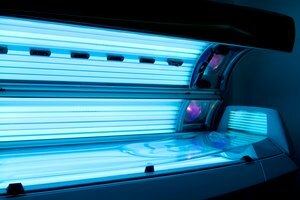 Tanning salons need to clean and disinfect the tanning bed bulbs after every session. If you aren't doing this, tanning lotions, dust and other debris may be on the bulbs, blocking the light. You should always replace all of the bulbs in a tanning bed at the same time. Replacing parts or half of the bulbs will make for a completely uneven tanning experience. When getting new bulbs, remember that the effectiveness will be at 100 percent for a while, so go easy on your first tanning sessions with the new bulbs.